For this Cat Train Newsletter, I'm starting to write this story on my fancy laptop computer that Southern Belle bought as a xmas gift. Also I'm in my winter freighting caboose 10 km from Tate Island in a March blizzard with zero visablity on the biggest body of water known as Reindeer Lake. But the best part is Southern Belle and Xena are with me to enjoy the excellent scenery and the Northern Lites. The Tate Island story begins with a new lodge owner named Jim (in Canada you have to be named Jim to own a lodge, example DOUBLE J ADVENTURES) buying a swampy buggy with a stone boat to try and haul building material to lodge. Well the swampy buggy broke down 4 miles out on the lake on the first trip, which is a good thing because with the stone boat, the swamp buggy would have self destructed due to the hard pulling. Jim the lodge owner calls me and asks if I would head out and take a look at the swamp buggy to see why it broke down. So I load the TD-6 known as the "CURSE OF REVERSE" on the Linn Tractor trailer (a custom made trailer for hauling Linn Tractors) and prepare to head out in the morning to pull the broken swamp buggy off the lake. I check the weather in the morning before I go to leave and everything looks good, the joys of the internet! The "CURSE OF REVERSE" decides not to start on the Linn Tractor trailer, I always start my equipment before I leave the "KINGDOM" because some of it is 60 years old and very moody. By lunch time I blow a gasket and use the front end loader and shove the "CURSE OF REVERSE" into my little shop sideways to work on it. I then phone up to Kinoosao, SK. (which is the access point to Reindeer Lake) to tell the First Nations Guides that I'll not be up there today due to the "CURSE OF REVERSE" not starting. They tell me it is a good thing you didn't come due to the blizzard like conditions they are having. Talk about the "CURSE OF REVERSE" being lucky, if he had started I would have been out on the lake when the blizzard hit. I had the "CURSE OF REVERSE" up and running that afternoon and have changed my opinion towards the little TD-6 cat. So then the lodge owner named Jim arrives in Lynn Lake, Mb to see how to get this project under way, he is a little concerned due to the fact that his swamp buggy and lumber is all over the place. I would be too, if it was my money waiting for the snow and ice to melt! First game plan is to get the lumber on some decent freighting sleighs and finish the D6 9U known as "THE HOOD" to pull the over-loaded sleighs in the extra deep snow. 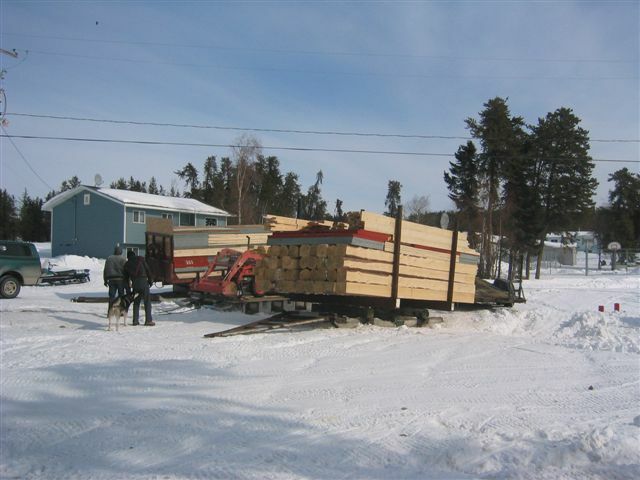 So the lodge owner named Jim gets the sleighs loaded with the lumber which he did an excellent job on, along with his First Nation Guides. Then we get my buddy Barry to lowbed the D6 9U known as "THE HOOD" out to Kinoosao, Sk. which is only 100 km from the "KINGDOM" but takes 2.5 hours to drive the road which is up a hill and down around a corner, then up a hill down around a corner. The fellow who engineered this road was not at the top of his engineering class, he must have gotten his diploma from a cereal box. When I arrive at Kinoosao, Sk. to see my loaded sleighs sitting on 3 feet of hard packed snow my heart sank. This is not good because once I hook up on to the sleighs all they will do is sink in the snow and be very very stuck. This is the first trip out with the D6 9U known as "THE HOOD" since I spent the winter tearing it apart and putting it back together. I went right through this cat to see what 3 years in a watery grave would do for damages. This cat was sunk with the D6 9 U known as the "BISMARK" which has had two Cat Train Newsletters written on it's life after being salvaged. We decide to pull the over loaded sleighs out on to the ice and hook them up there for fear of being stuck in the extra deep snow. The D6 9U known as "THE HOOD" pulled the loaded sleighs one at a time with no problem down to the lake. This amazed me, but now I see why the D6 9U was a very popular winter freighting cat of the Great White North! So with all the loaded sleighs hooked up in a Cat Train fashion, I hook up the D6 9U known as "THE HOOD" and get going to put on a good show for all the people of Kinoosao, Sk. that are watching from shore. 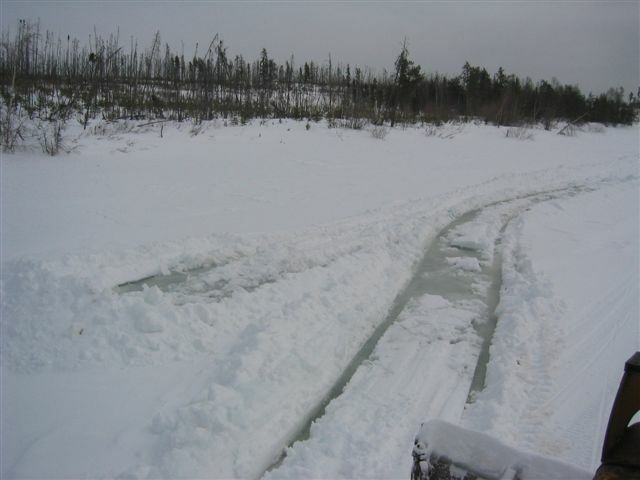 Well, I went ahead about 100 feet before I had the cat spinning out due to lack of traction on the ice. The trick in winter freighting is to plow enough snow off the trail so that the loaded sleighs don't hang up, but leave enough snow for traction. Well I mis-judged this due to the first time out with the D6 9U known as "THE HOOD" plus the sleighs are about 5 tons over weight from the regular 10 ton they are designed to haul. Well this is is no problem because my cup of coffee is always half full! This cat has a big winch on the back so I'll just run out the line and pull the loaded sleighs off the deep snow that is hanging them up. So with everybody on shore watching, I run out the winch line then drive the D6 9U known as "THE HOOD" up on to good snow conditions, so I thought. When I go to pull the loaded sleighs with the winch, all that happens is the cat is dragged back to the loaded sleighs. I try different things but still all I end up doing is pulling the cat to the loaded sleighs. Oh well, I tell everyone that I needed to rewind the cable on the winch because it was too loose. That is my story and I'm sticking to it. So once I figured that "THE HOOD can't pull 3 loaded sleighs and plow snow with a straight dozer blade (vee plow would have worked) we unhook 2 sleighs and head out to do the road break to the lodge with one loaded sleigh with Jim the lodge owner riding on top of the sleigh. One mile out from Kinoosao, Sk. "THE HOOD" does a nose dive through the ice, but I was quick enough on the reverse lever and walked the cat out of the hole. If I had the other sleighs hooked on, "THE HOOD" would still be in that water hole, but hopefully not for 3 years like the last time he was sunk. So Jim the lodge owner was very shocked that I just backed up and drove around the hole in the ice and continue on. I think he was up on top of the sleigh blowing up his water wings like what the kids use at the paddling pools. About 1/2 way to the lodge, our First Nation Guide took Jim the lodge owner by ski-doo the rest of the way, due to him freezing to death on top of the sleigh. The First Nation Guide points to the far shore line and said that is where the lodge is before he left me to continue on my own. Since I have never been to this lodge and I never had a chance to ski-doo out and see the route for myself, I must trust him since he was born and raised here. As I continued to Cat Train across this big lake known as Reindeer Lake, I realized that this First Nation fellow can see about 5 miles farther than me. That far shore line takes forever to come into view at all of 5 km per hour but it was a beautiful night to enjoy the full moon and Northern Lites. As I follow along the ski-doo trail that marks the way to the lodge, I start to wonder if they have moved the lodge because I see no lights or anything that would tell me where it is. The last lodge I went to was 45 kms away ended up being 76 kms, so from then on I have always checked the location by ski-doo and maps. Then I come to a point of land and there is the First Nation Guide sitting on his ski-doo motioning at me to get closer to shore. So I stop the cat and ask him why? He tells me that there is open water only 50 feet from the Cat Train, so stay closer to shore. I thanked him for doing his job as a guide and asked where is the headlight on his ski-doo. If the ski-doo head light had been working it would not have seemed to be such a long trip. The First Nation Guide tells me that he doesn't need a head light because the SPIRITS will guide him. Ok, it would have been nice to tell me about the SPIRIT thing before we left on this Cat Train trip! I finally arrive at Tate Island Lodge at 11:00 pm to find out that all the cabins have 8 foot snow drifts covering the only doors to the cabins. The joys of a record snow fall year we are having this winter of 2004-2005, the "Old Timers" say they have not seen this much snow since the winter of 1949-1950. 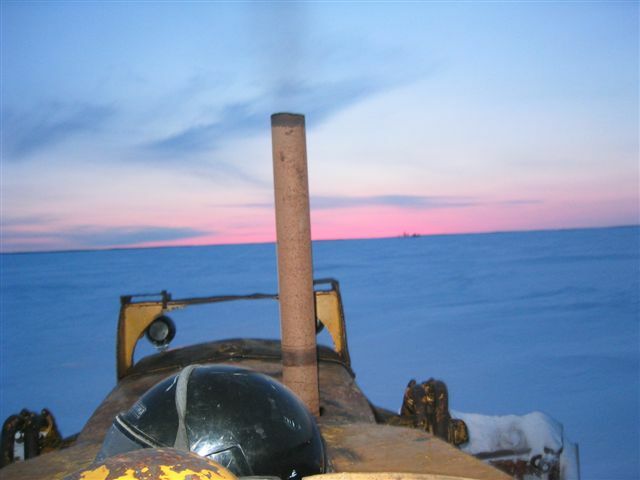 I leave the Cat Train on the ice in the bay of the lodge and get a ride to shore with the First Nation Fellow on his SPIRIT driven ski-doo. Not too sure about the SPIRIT thing again due to the fact that I had 1/2 the forest's tree branches whack me in the face. I thank the Guide and off he goes to his cabin in the woods, I never seen where he went due to the lack of a head light! I open the door to the little log cabin thinking that is is going to be toasty warm because of the roaring fire in the wood stove. Wrong! This cabin doesn't have a wood stove, but has a fuel oil fired stove that is malfunctioning big time! Jim the lodge owner has brought in a couple of those kerosene heaters that one has in their basement rec-room to take the chill off. Jim assures me that once the heaters take the chill off in the cabin it will warm up. Right is all I said, maybe in June, not in March in the Great White North! So off to bed we go, I jump in to bed with all my winter outdoor clothes on and crawl into the sleeping bag for a long cold night. I hear Jim the lodge owner drop his pants on to the floor of the dark cabin as his gets in to bed. When I awake in the morning, boy is it cold! It brought back memories of when I went to that other lodge in the first Cat Train Newsletter where they made us stay in a tin shack and fed us caribou stew out of a 5 gallon pail. Jim the lodge owner is a frozen popsicle but alive I would say. So to warm up, I hop on "THE HOOD" and start pushing snow to get the engine warmed up which heats the operator's area. Now that I have cleared enough snow on the shore line to bring the loaded sleigh ashore for the boys to unload, I'm starting to feel a little warmer. After I spot the sleigh, I put the hammer down and head back to get the other loaded sleighs with "THE HOOD" in the highest gear possible. I stop and hook up to the broken swamp buggy to drag it to Kinoosao, Sk. so it can be loaded onto a truck to go to the South where it belongs. Everything is going well, too well in fact, because I got the loaded sleighs 6 miles out on Reindeer Lake before "THE HOOD" broke down. I lost power to the right side track and all the cat wants to do is spin around in a circle. So I clean the snow away and park the sleighs and cat and begin my 6 mile walk to Kinoosao, Sk. which gives me lots of time to think of the next plan.